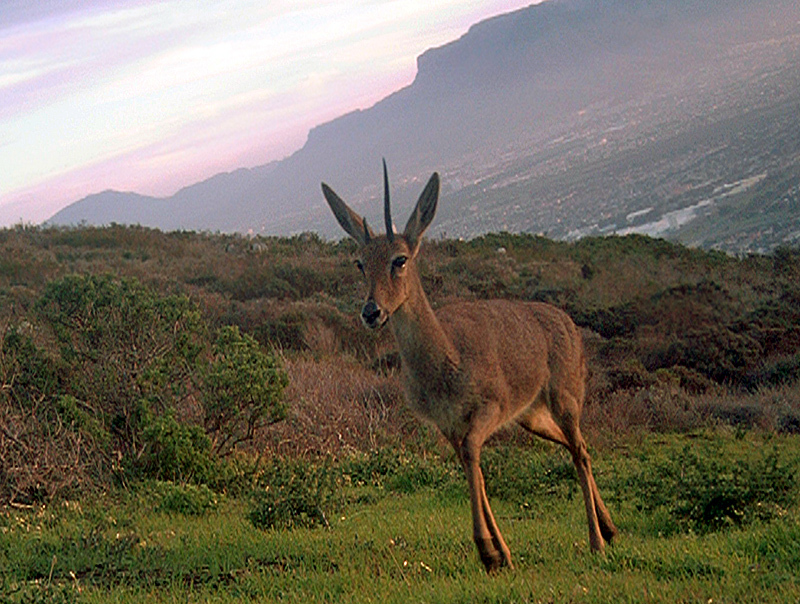 I've finally gotten around to capturing all of my Tygerberg camera trapping photographs into WildLog. As I was processing the last set of images this Grey Rhebok caught my eye. This is the resident male, easily identified thanks to his broken horn. Short on his tale was one of the females, stopping briefly to have a bite. 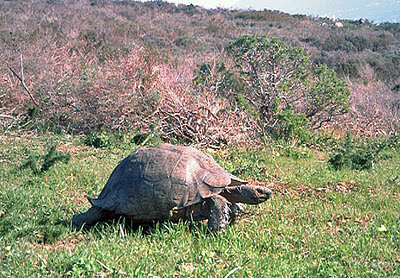 Another fun visitor was the Leopard Tortoise. These guys are big enough and warm enough to easily trigger the camera when they are on the move. And to wrap things up a Helmeted Guineafowl in full stride. I still haven't had much time recently to do any serious camera trapping. I'm looking forward to doing a short stint over Christmas when we visit the family. In the meantime I thought I'll treat you to some interesting critter from my garden here in Cape Town. It is incredible what amazing creatures live right next to us. This is just a small selection I threw together. There is an amazing variety of bees (and other insects) that pollinate the flowers in our garden. I haven't managed to photograph even half them all. Below are two bees I recently snapped a picture off. Below is a very interesting pollinator, a fly. These flies parasitize on spiders in their larval form. The adults have short lives. Some species sip nectar with their long tongues. Naturally there are also butterflies and skippers around to be found. 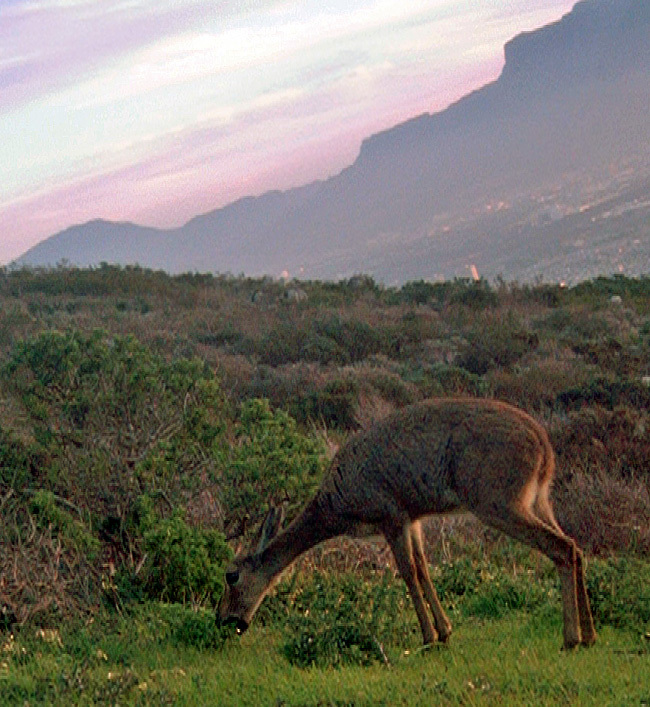 When we first moved down to Cape Town we lived in the southern suburbs. 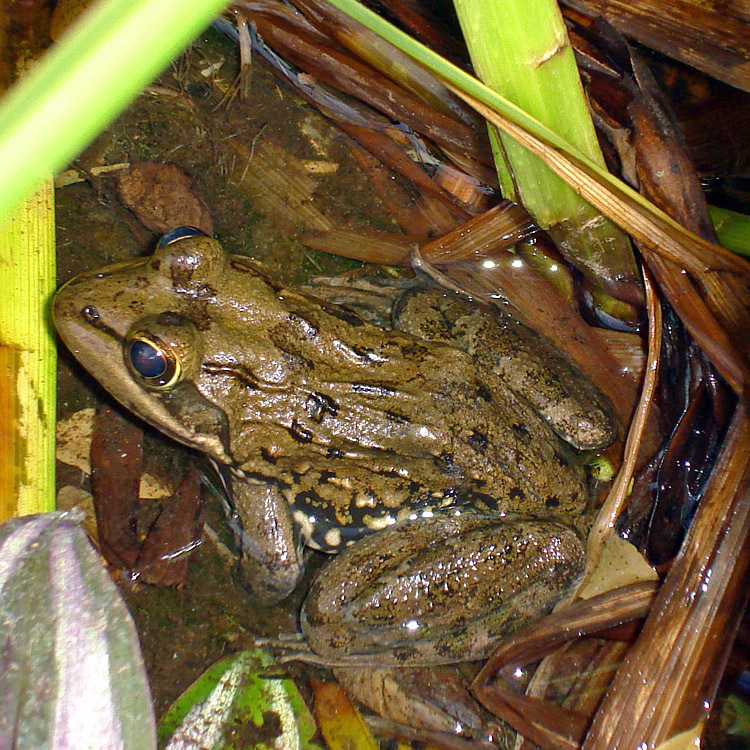 The yard contained a small pond that was home to some frogs. I tried to photograph all of them to determine how many there were. 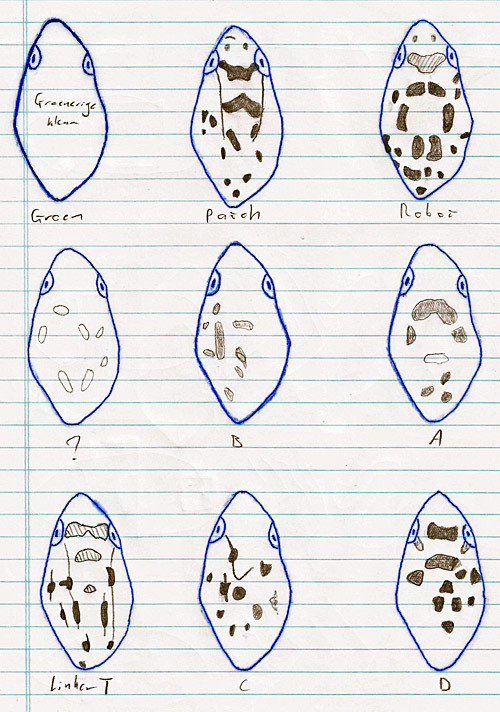 I could identify at least 8. 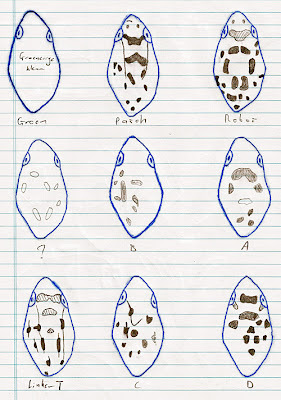 A year later we moved to the northern suburbs and I introduced some tadpoles to our new pond, but the walls are to high and when the small frogs emerged they jumped out of the pond and couldn't get back in. However our neighbours told us that the little frogs found their way to their pond and seem to be doing pretty well over there. I might have a healthy fear of spiders, but this little fellow was so intriguing that I just had to take a picture. It reminds me of the spider (Shelob) from The Lord of the Rings films. Last, but by far not the least, is the inspiration behind this post. This weekend my wife spotted a Cape Dwarf Chameleon living in our garden! These guys are just to cool and pretty for words. "Ah man ... how did they see me?" And if you were wondering whether he managed to climb up the trunk to safety? He did. The moral of the story: always keep your eyes open, you never know what you can find, even in your own back yard. This post wraps things up from the Magaliesberg trip. 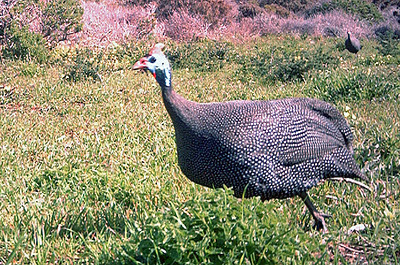 A couple of common bird species visited the cameras during the short period we were there. One can find the doves living throughout the whole of South Africa. Another common species that you are bound to run into throughout most of South Africa is the Cape Robin-Chat. The resident Natal Francolin also made the best of the feast. For the untrained eye these guys might look like the Cape Francolin (I commonly photograph at Tygerberg), but there are subtle differences and their ranges don't overlap. The Kurrichane Thrush also has a close relative (I've photographed) living in the Western Cape, the Olive Thrush. Yet another species I've also photographed it the Magaliesberg, as well as at Tygerberg, is the Southern Masked-Weaver. They are also very common throughout the whole of South Africa. I've camera trapped the Southern Boubou on two occasions in the Magaliesberg. Its range extends into the Western Cape, including Tygerberg, but surprisingly I've never photographed any at Tygerberg. The Dark-Capped Bulbul looks a lot like the Cape Bulbul found in the Western Cape, the biggest difference being the area around their eyes. Although the Crested Barbet is fairly common in the North and East of the country, they aren't found in the Western Cape, making this fellow a welcome addition to my camera trapping records. In Afrikaans their known as (roughly translated) "Arrow-Marked Cat-Laugher", makes one think of laughing cats... None of the Babler species are found down South, making this another new camera trap record for me. These guys move around in small groups, laughing as they go. And to wrap things up here are two photographs I took of some huge ants. 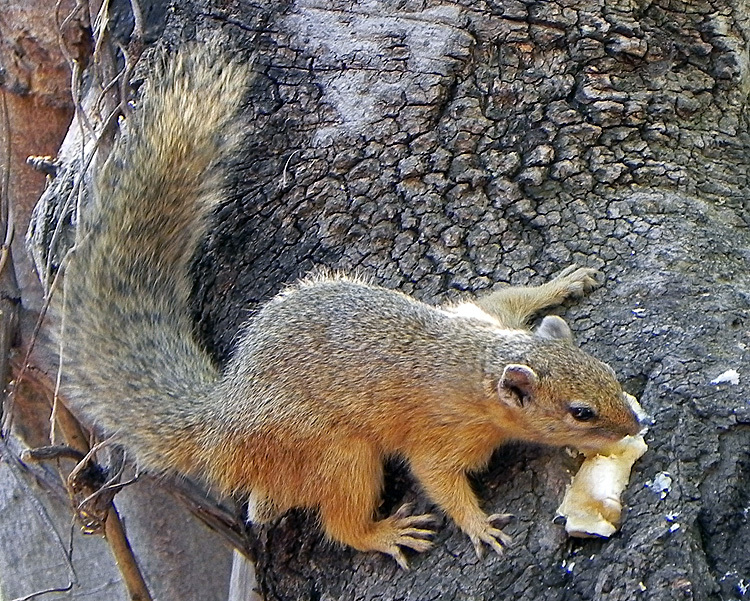 The other mammal I photographed in the Magaliesberg is the Tree Squirrel. 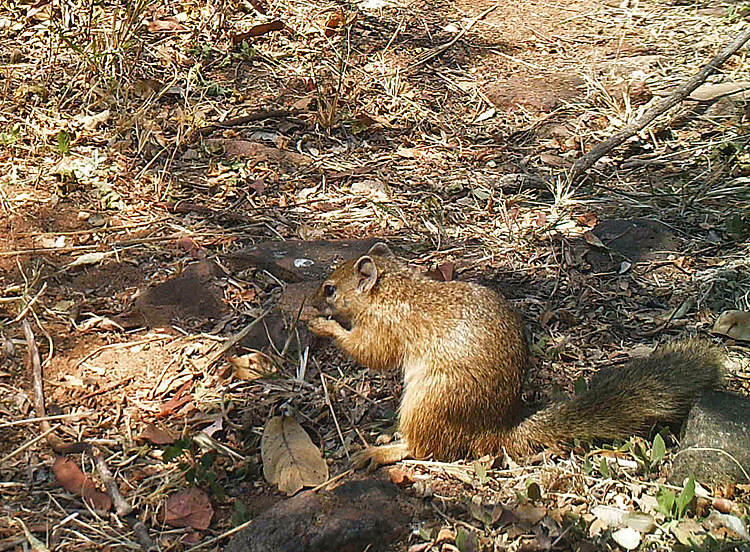 The above picture was taken with my handheld camera, but the camera traps saw plenty of action as well. Planning on making a sandwich? As mentioned in the previous post the bread seemed to be the most popular item on the menu but the squirrels also enjoyed the sunflower seeds and fruit. On a normal day these guys eat a wide variety of plant material and insects. They didn't seem to mind the cameras much. They are also quite tame around the house and I managed to get some good photographs by just sitting about 4 steps away from them. 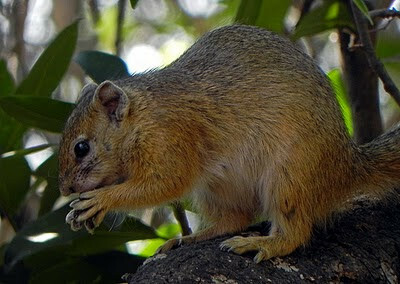 Although these are Tree Squirrels, they still spend a lot of time on the ground looking for food and moving between trees. They prefer woodlands but are absent from true forests. 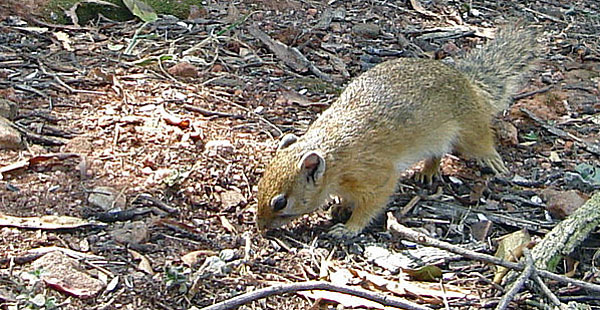 These little squirrels are much smaller than the alien Eastern Gray Squirrel found in the south around Cape Town. You can see some previous posts about them over here. Next time I'll wrap things up at the Magaliesberg with a couple of images showing the birds that payed the cameras a visit. The Slender Mongoose has always been, in my opinion, a rather handsome animal. Their colour varies from gray to reddish-brown, but the ones in the Magaliesberg seem to have an interesting mix of both. I'm pretty sure that I photographed two individuals, but it could be more. My guess would be mother and child. I've managed to photograph two individuals together on a previous occasion as well. Although these mongooses are mostly solitary hunters they exhibit a surprising amount of sociality. 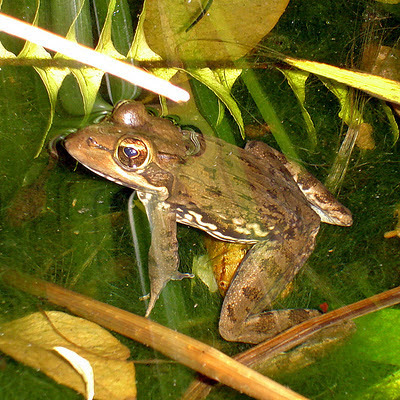 Males sometimes form a type of "coalition" to defend their territory. The youngsters can stay in the females' territories for up to two years before dispersing. Another interesting feature of these mongooses are that they like to lift the black tip of their tall of the ground. The weather was great but veld was still waiting for the first rain to arrive. Almost like the calm before the storm. Every plant and animal just waiting to switch gears into spring then summer. After my unsuccessful camera trapping the night before I decided to lay out a banquet in the hopes of attracting the local diurnal mammals. With the end of the winter and dry season at hand it didn't take to long for the first animals to show up. 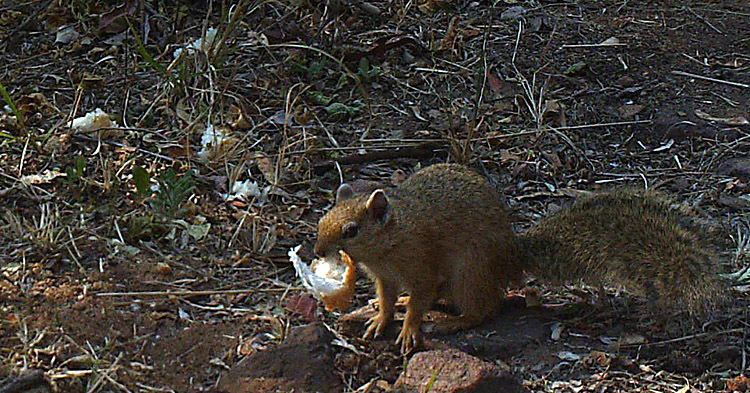 Interestingly enough the bread proved the most popular with almost all species (mammals and birds) taking a bite. 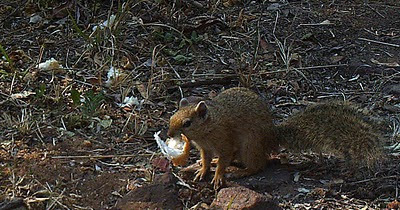 But the mongooses also enjoyed the meat scraps. The sunflower seeds and fruit were enjoyed by the other visitors, but more about them later. The Slender Mongoose hunts mostly insects and small animals (reptiles, mammals, etc. ), but they don't seem to turn up their noses at bread or an empty fish cans. Most of these image where taken right next to the house. The animals didn't seem to be too alarmed by our presence as long as we remained out of sight. The Slender Mongoose is a very common species found throughout sub-Saharan Africa, with apparently up to 50 subspecies. To wrap things up here is one of these fellows munching on some bread, in style. This past weekend my wife and I flew up to Johannesburg for a friend's wedding. The wedding was in the Magaliesberg and we took the opportunity to sleep over at the small nature resort called Utopia. We haven't been there in more than 3 years and were looking forward to it. It was here in the Magaliesberg that I did my first true camera trapping. You can find my old post over here. This time around we only spent one night at Utopia, but I still made a last minute decision to take some camera traps with me. I ended up taking a Bushnell (2010 model), a homebrew Yeticam Sony s600 and a ScoutGuard (flash model). I had only one night to trap for the nocturnal mammals and I set out looking for a good location shortly after we arrived. I set the Bushnell next to a stream (in the picture above). I saw signs of Cape Clawless Otter (Groototter) and Water Mongoose (Kommetjiegatmuishond) and thought it might be worth the risk. The verdict: nothing passed during the night except for some humans. I'm assuming they were from one of the other houses. 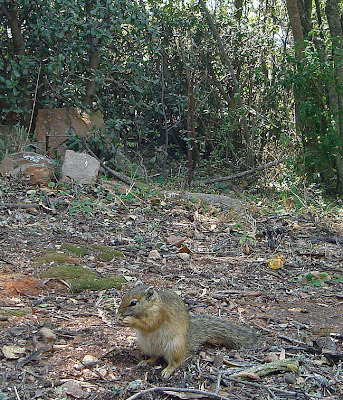 Luckily there is plenty to see even without the help of camera traps. This Scrub Hare showed up just as the light was fading. 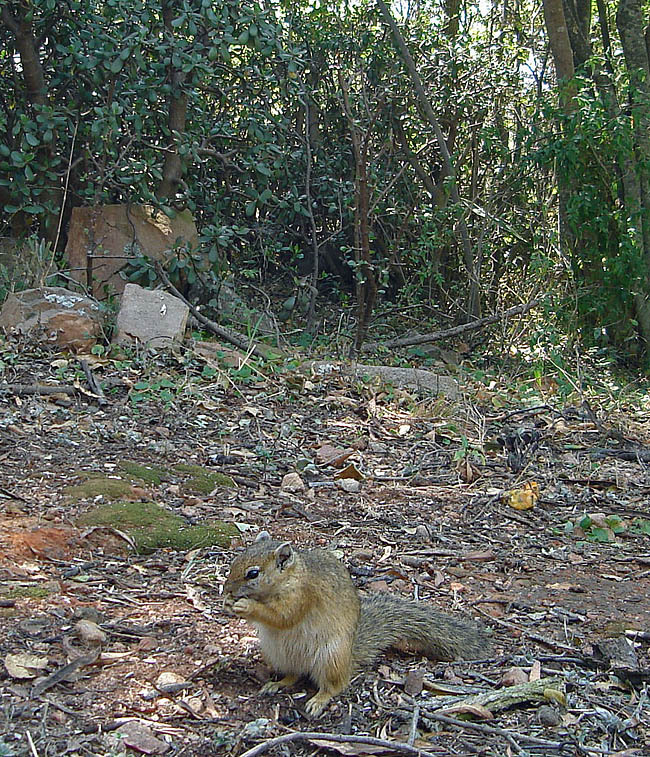 I was hoping for some camera trap images of these guys (there were two), but they managed to evade the cameras. We also saw a Bushbaby (Nagapie), Baboons (Bobejaan) and plenty of tracks such as Porcupine (Ystervark), etc. When I tried to setup the homebrew Sony I ran into another problem. The Sony's lensgears are problematic. I managed to fix it at home, but it started to give problems again. I think it might have been the vibrations during the flight. Luckily in the end I got it working. I found a very promising spot for the Sony, but nothing walked past the camera during the night. If I had a week or two I'm sure I would have gotten some great images at the location. So, by now my last hope was on the ScoutGuard... I have one word to describe this camera: disappointment. If you are thinking of buying one, then don't. If you already bought one, then I feel your pain. On top of all it's shortcomings the camera chose this weekend to stop flashing. I had a great location and had some good bait set out. I even had nocturnal visits, but nothing to show except some completely black photographs. The camera still triggered, but the flash never fired. So in the end the night was lost. I didn't get any images of the nocturnal animals, but I still had half a day to go and I pulled out all the tricks I could think off to skew the odds in my favour. I ended up capturing two mammal species and a couple of birds. Nothing new, but both species aren't found down here and make for a welcome change.